Well, even though I had to chew on it for a while, this month colour combination really attracted me. 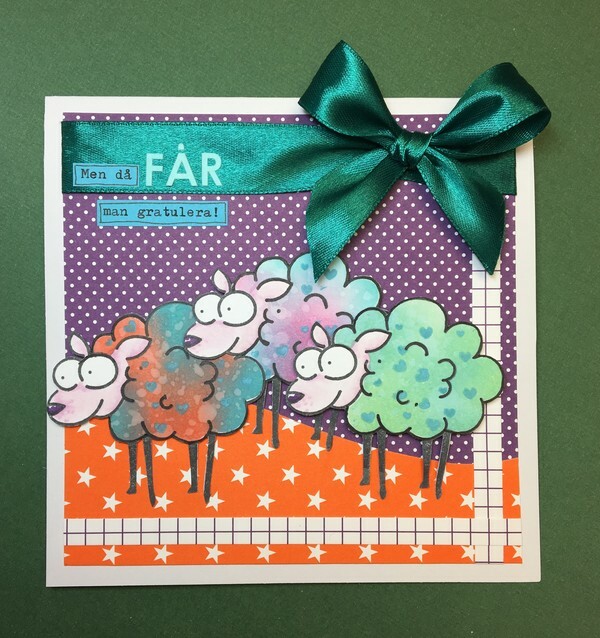 It's a birthday card but I've played a bit with two different meanings of the word får/sheep. The wool is coloured with distress oxides and sprayed with water. For this I used some Post-It paper. 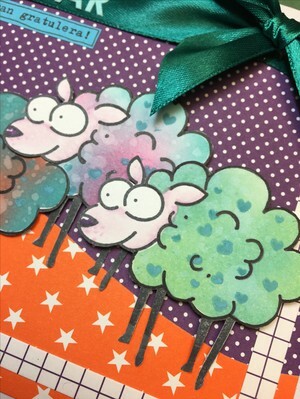 I stamped the sheep and cut out the part I wanted to colour. 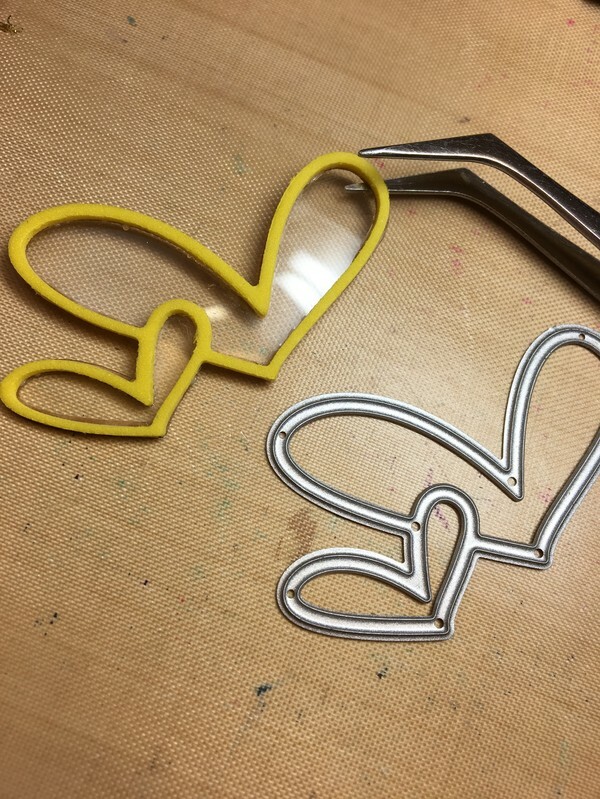 Then I used the Post it-paper as a mask or stencil. An easy way to get the colour where you want it! FInally I added some small blue hearts. I Gummiapans fb-grupp "Skapat med Gummiapan" är det fortsatt skissutmaningar. Om du gillar Gummiapans produkter är det bara att hänga på, skisser är kul! Jag har tolkat skissen relativt nära. De lodräta linjerna har jag färgat in med distresser direkt på min kortbas. Allra först stämplade jag texten, infärgad i lite olika gröna och blå toner. Min vågräta del symboliseras med en bit snöre. En liten närbild. 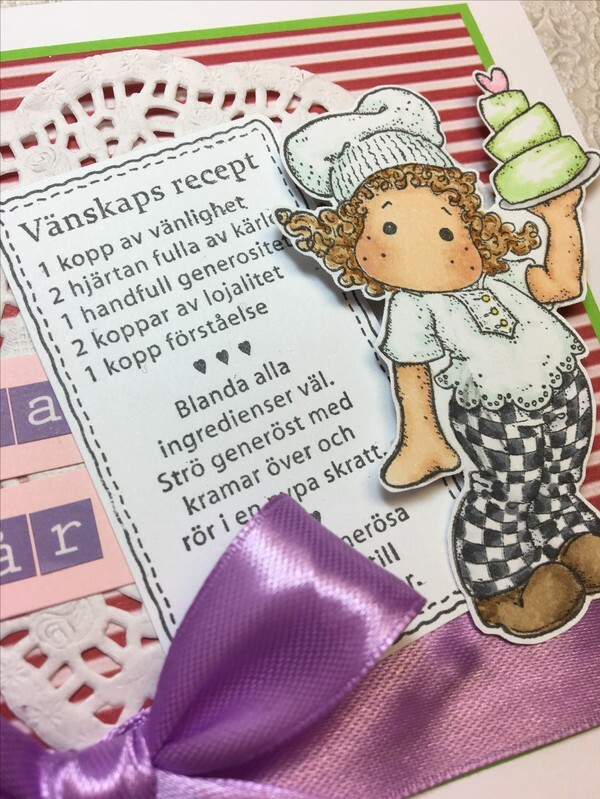 Både texter, hjärtdies och det prickiga pappret kommer från Gummiapan. Jag deltar också med detta kort i januari månads färgutmaning hos Rubber Dance. 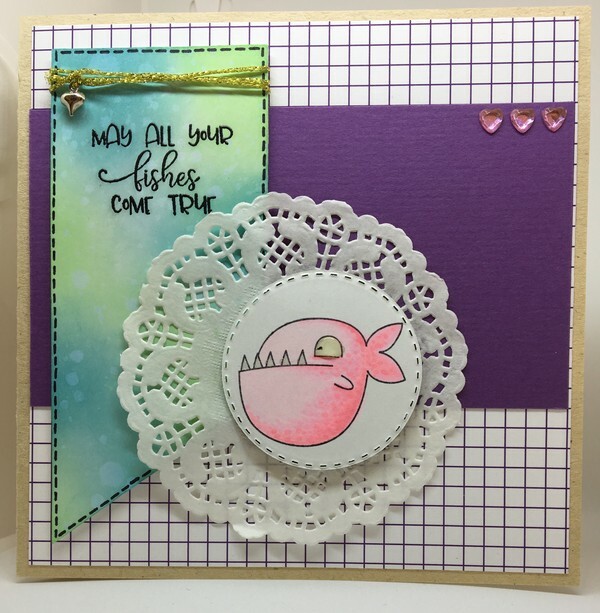 This card is also my take at Januari colour challenge at Rubber Dance Blog. 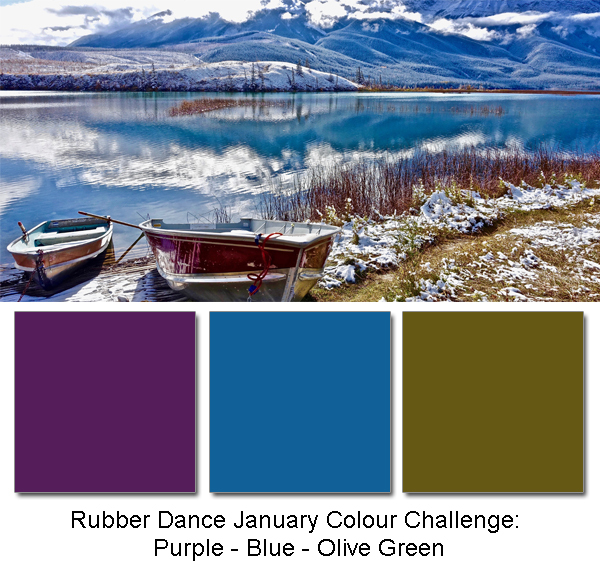 This month the colours are Purple, Blue and Olive Green and/or Make it Vintage. As you can see I've followed the colour scheme. Medan jag otåligt väntar på att få göra mitt första blogginlägg som ny DT hos Gummiapan så passar jag på att göra ett inspirationskort efter Jeanettes skissutmaning i fb-gruppen "Skapat med gummiapan". Om du gillar att använda GA-stämplar så häng på vettjá! Men visst blir man lite kär i honom, bara kolla in den sluga uppsynen!! Han är en liten piraya och du hittar honom HÄR! I vanlig ordning har jag färglagt med Copics-pennor. 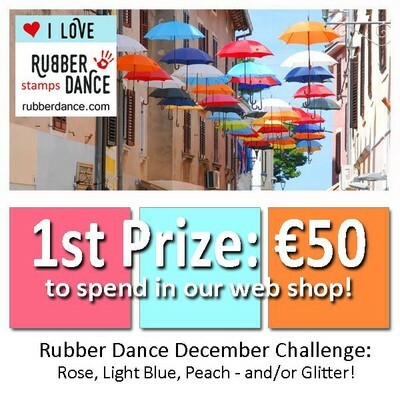 Rubber Dance December challenge -a third one! This time I have made a CAS, a clean and simple card. That doesn't mean it's easy to manage, not at all what I usually do. 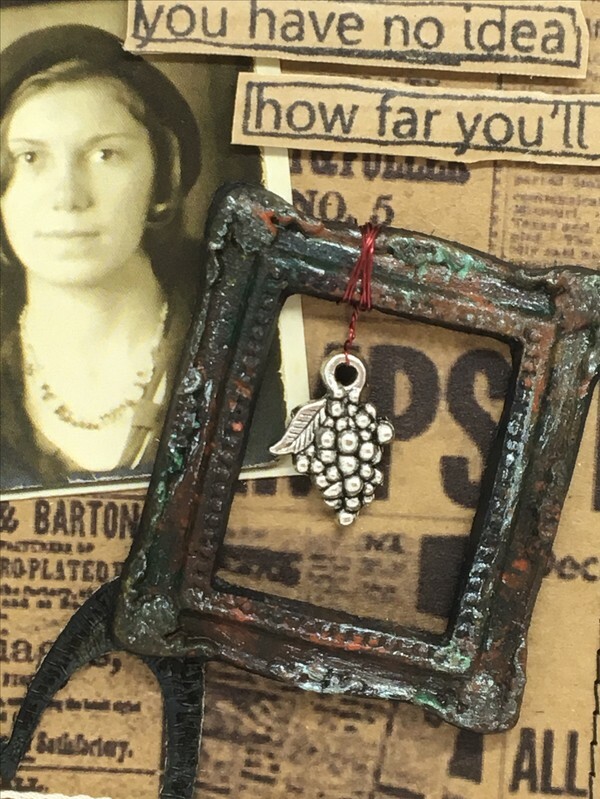 But I have a crafting friend that is a whisard when it comes to this genre and she inspires me to give it a try once in a while. Who? Well, Anna is her name but you've probably seen her as Uraanna at Instagram or Urascrap. 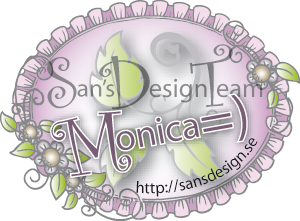 It looks and is supposed to look simple: just a text stamp and a heartshaped dies (Yes, from Gummiapan once again). The heartshaped dies gave me the idea of creating a supersmall shaker container. Why make it easy when you can complicate things?! So I used some foam and after a bit of fussy cutting glued a piece of OH-plastic on top of it to create a small container. 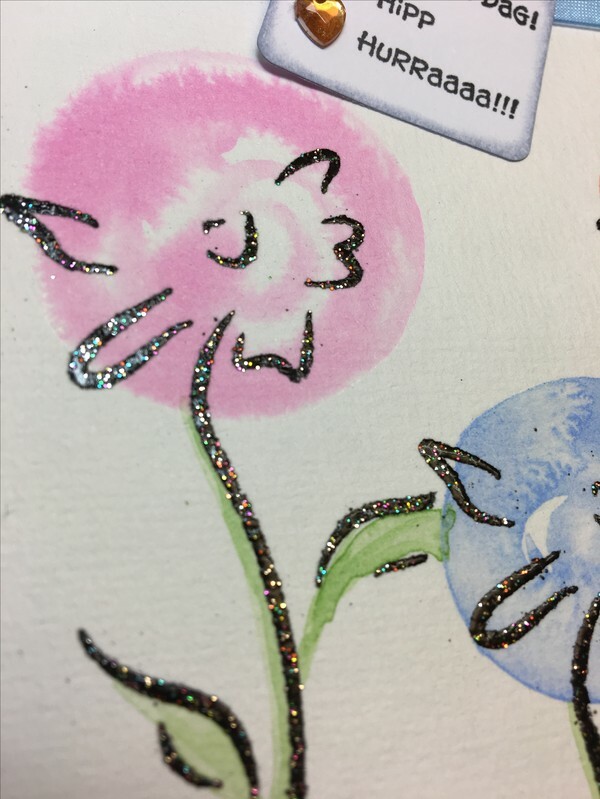 I used some hard-grained glitter, a bit of the heavier type, since the container is so small and I didn't want all the glitter to get stucked in a corner. To get this to work I had to pour the glitter on the cardbase and adjust it according to where I wanted my container. And yes, I like to challenge both my stubbornness and my patience! Wish you all a great last day of the year! Rubber Dance December challenge -one more! 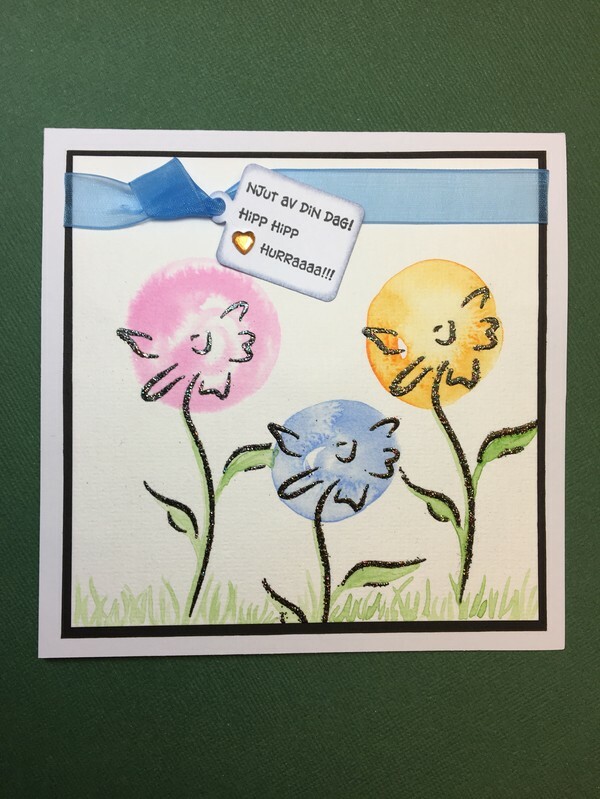 I've colored circles on aquarelle paper and then stamped and glitterembossed a flower. Yes, both the colours and glitter as well =) Can't have too much glitter I think! A close up at the glittery flower but a bit blurry I'm afraid. Well, at least you can see it's glittery. 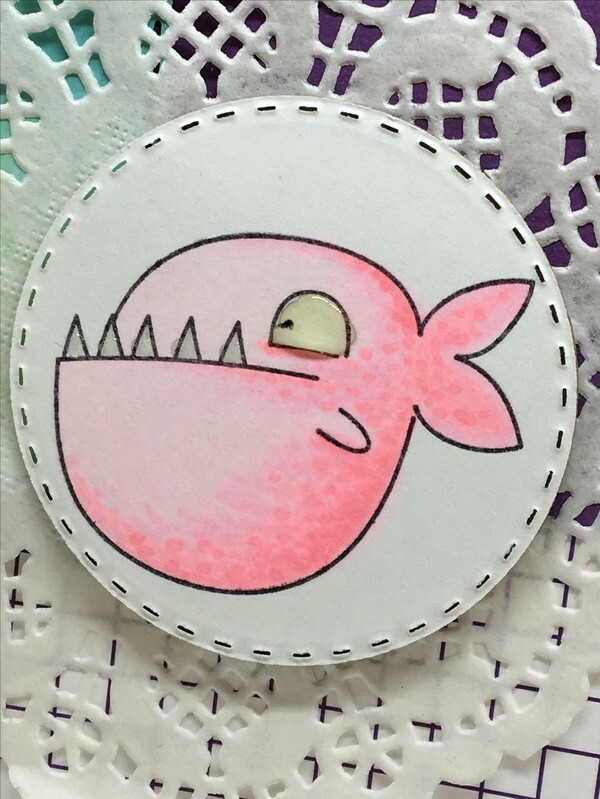 Since I don't own any of the beautiful stamps from Rubber Dance, I've used some stamps from Gummiapan again. Well, the colours are happy ones and a change from the Christmas theme so I decided to have a go! All the stamps come from a Swedish company called Gummiapan. 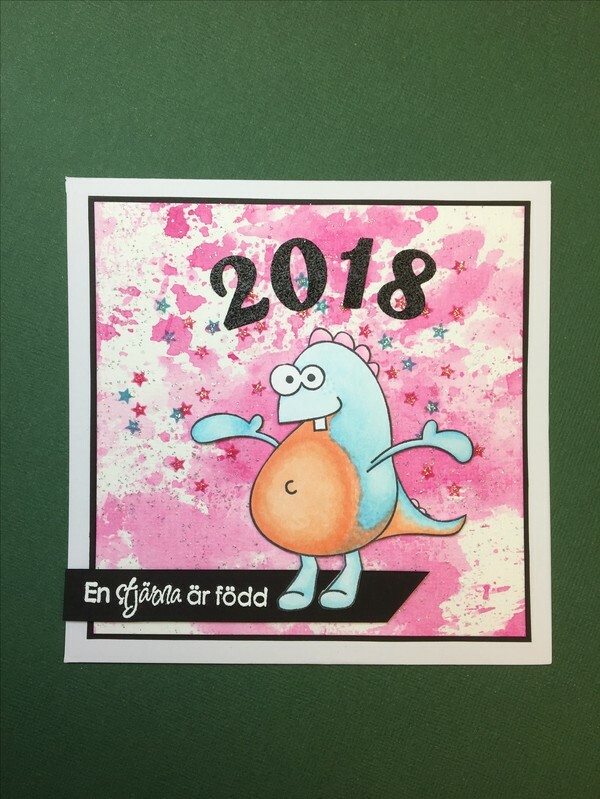 The text "En stjärna är född" means A star is born, perfect for the beginning of a newborn and glittery 2018! This happy fellow really looks as if he wants to embrace the new year! I've colored him with copic pens. 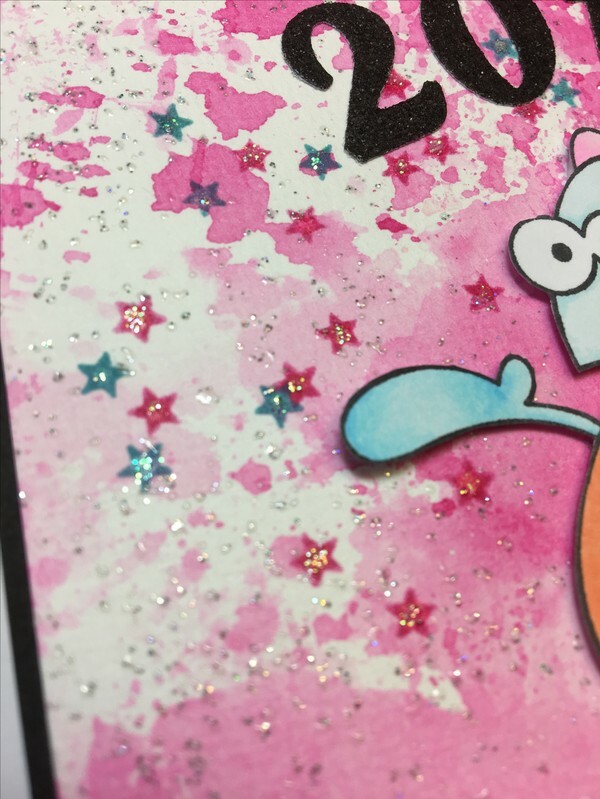 The glittery dots are a background stamp I've embossed and the tiny star stamps has a cover of glitter glue. 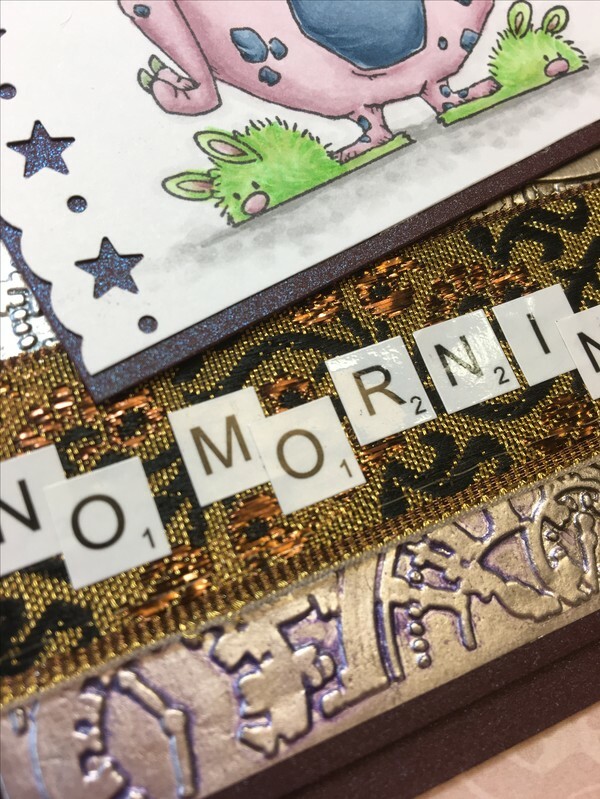 To crinkle and tear is great fun: my second take at the challenge at Paper Artsy. Well, lets start from the beginning.... As with the earlier card, I began with some old book pages. I colored them in with distress oxides and stamped as well, inspired by Claire. I sprayed some water to make the oxide color react and sprinkled some white and gold mist as well. After that I crinkled it. 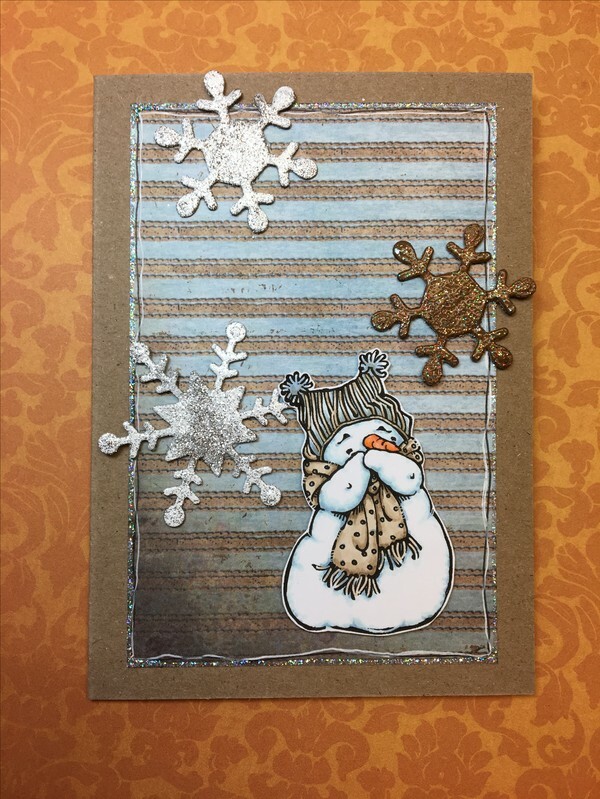 Inspired by Chris, I made a frame card and put my crinkled paper as a background with a snowman as a front figure. 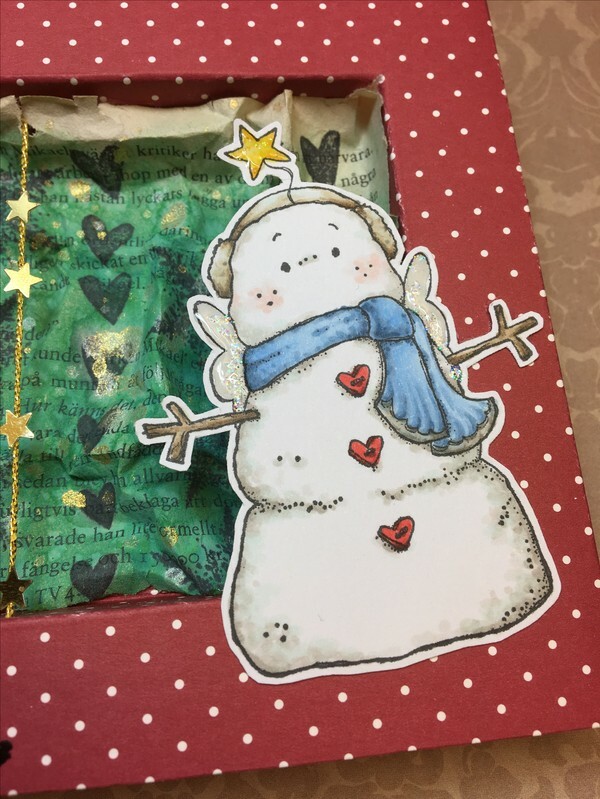 My snowman is a rubber stamp from Magnolia Design, a Swedish stamp company not far from where I live actually. I felt something was missing so with help of a needle I put some golden strings into the frame as well and glued a few golden stars on them. Finically? Oh yes, but why make things easy?! Also I wanted to add a God Jul/Merry Christmas in the bottom left corner. Still, why go the easy way....?! 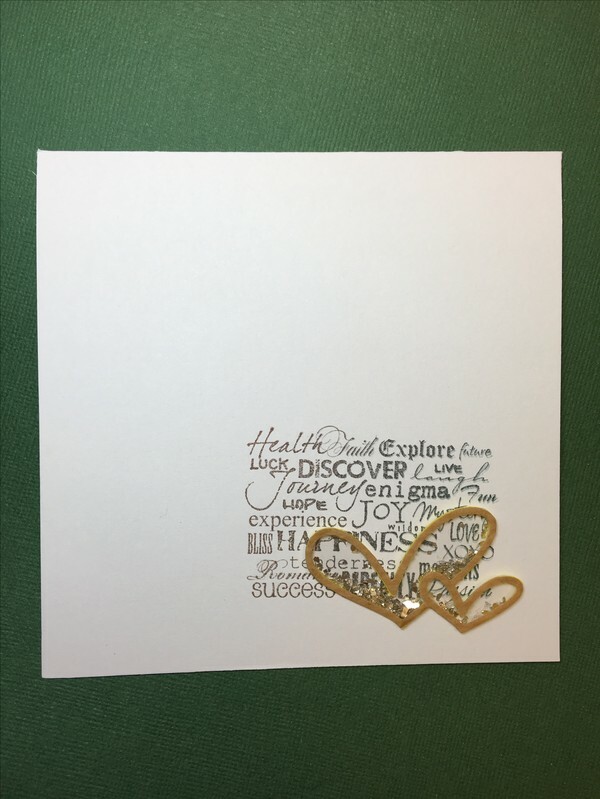 So at this late stage I decided to emboss my text.... Well, the card luckily survived! 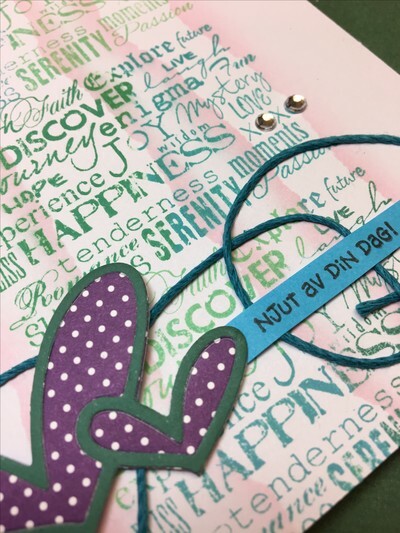 The text stamp comes from Gummiapan, another Swedish stamp company with a line of their own stamps, both in English, German, Danish and Swedish. 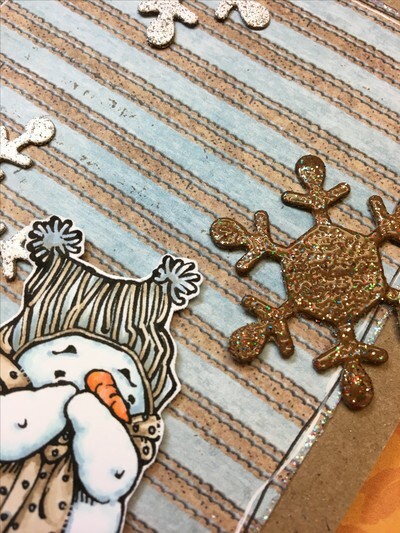 A close up at my snowman, colored with Copic pens. 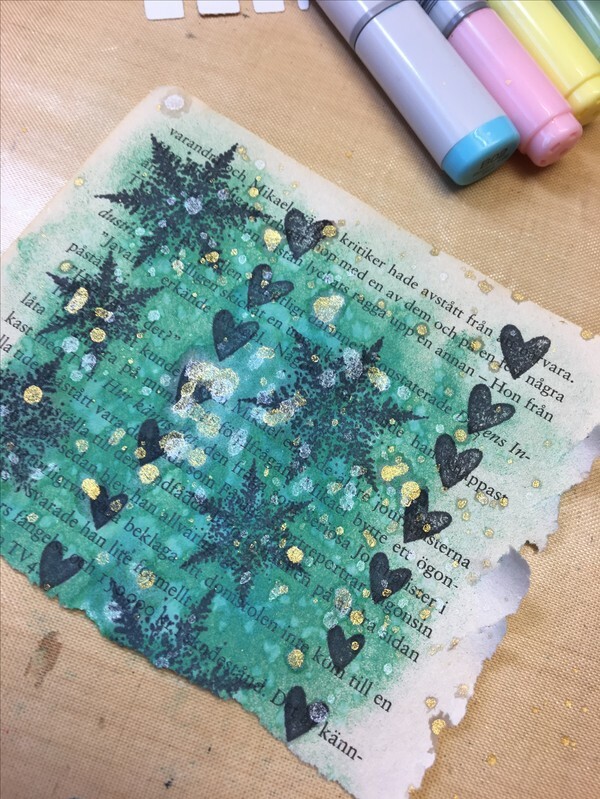 As you can see I've torn book pages inspired by the intro to the challenge. Between the torn book pages I put some cheese cloth just like Raquel did on her project. But first I tea dyed it like Lynne did with some lace. 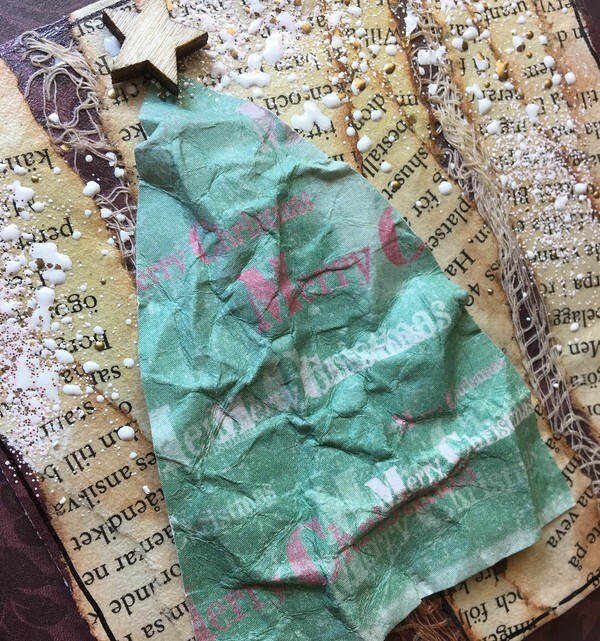 The Chistmas tree is crinkled, inspired by the background that Chris made. 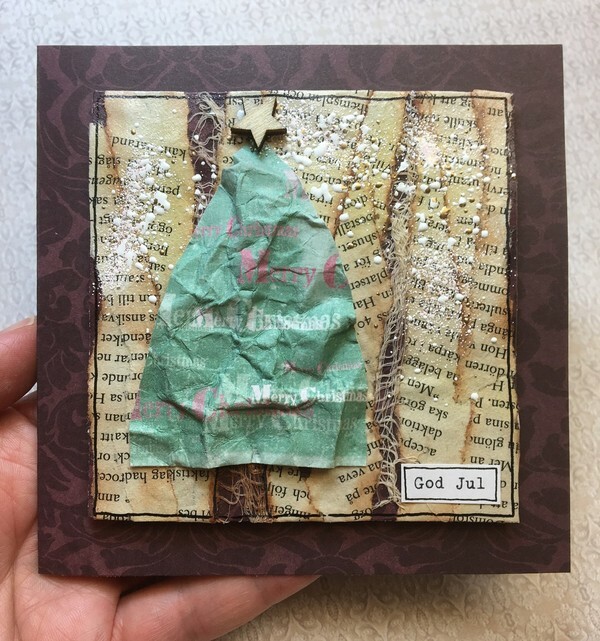 And to finish it up I added some embossing enamel and typed God Jul/Merry Christmas at the typing machine. 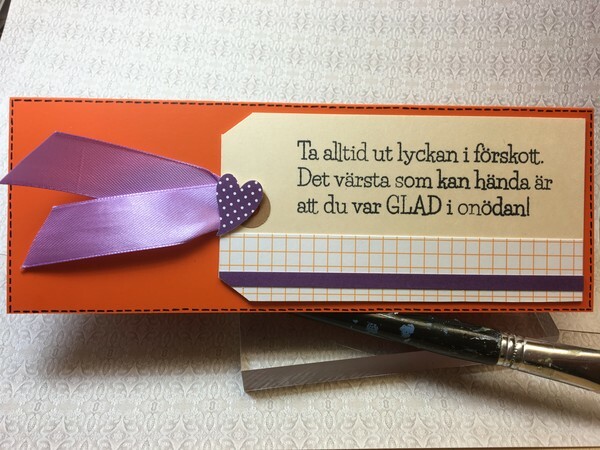 Jag var på scrapträff för ett tag sen och då fick man en stämpel + dies och finfina papper i eventets goodie bag. Det materialet inspirerade mej till tre kort, både lite lika och ganska olika. Första idén var ett färgglatt paraply flytande i vatten. 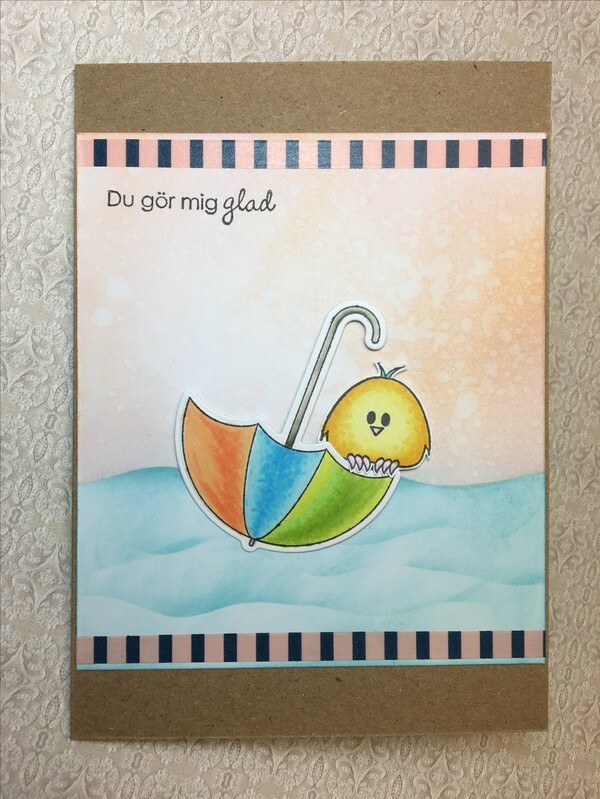 Copics och distresser åkte fram tillsammans med en charmig liten fågel och text jag hade sen tidigare. Om du missat det så finns det hur mycket härliga texter som helst i Gummiapans utbud. 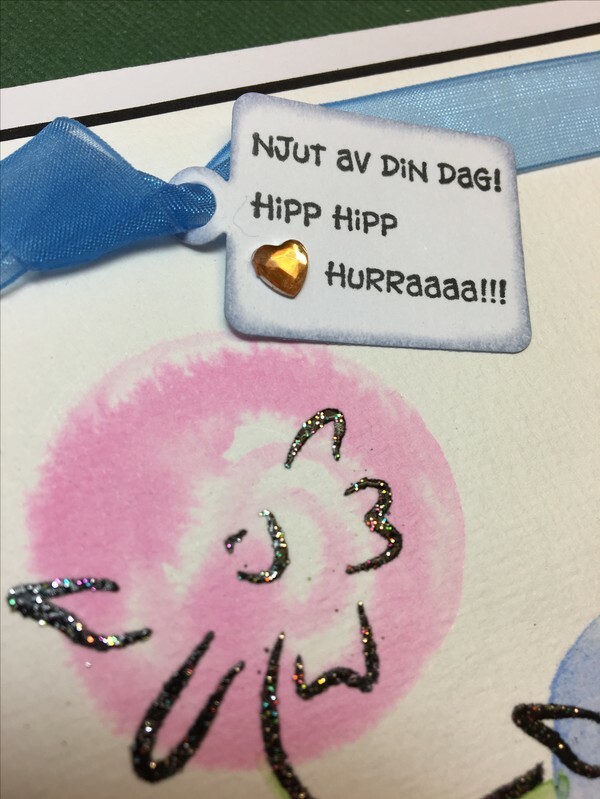 Extra kul att de kör sin egen linje både med stämplar, dies och papper. Här kommer en lite närmare vy, himlen är infärgad med två distressfärger och sen vattensprayad. Vattnet fixade jag till genom att maska med en bit post-it-lapp. Paraply och fågel sitter delvis på 3D-kuddar för att komma ut lite från bakgrunden. Själva lådan är stämplad och urklippt från en pizzakartong. Det där är ett material jag använder rätt ofta, jag tycker det bygger precis lagom mycket. Här syns det att jag även denna gång använt en del 3D-kuddar för att få volym. Visst är det härliga mönster o färger på de papper jag använt, riktiga gladfärger! Ha det fint och njut av vardagen! 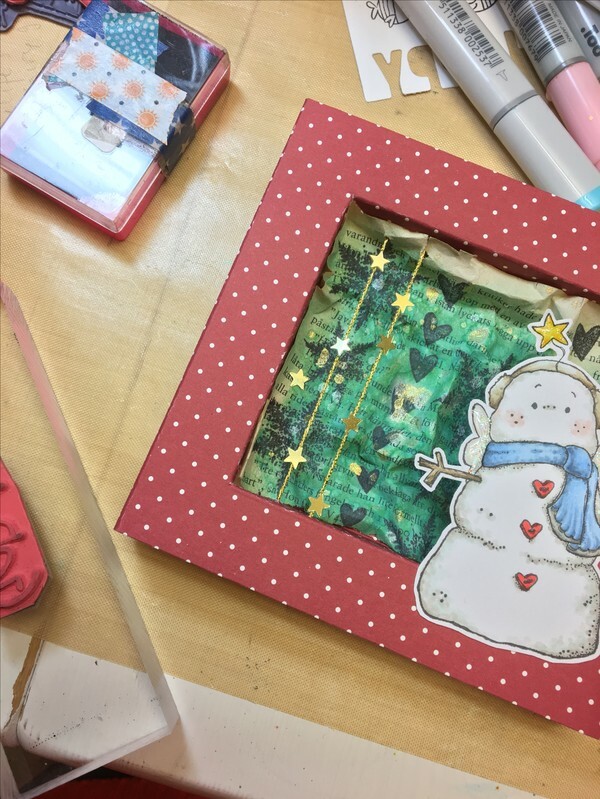 Well, when I made the hearts for the Rustification challenge at Paper Artsy I painted some more stuff, a frame made of paper clay. 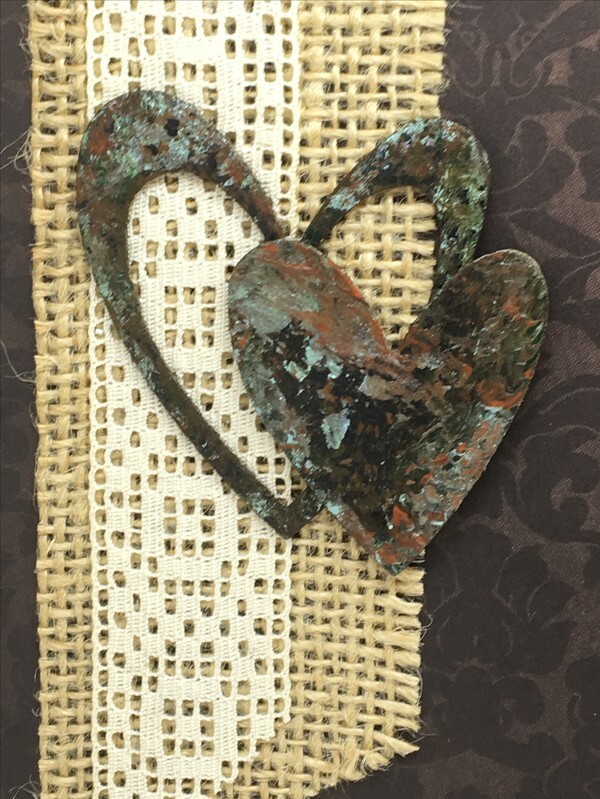 I used the same technique as with the hearts: black colour at the bottom and then adding brown and greenish colours, still inspired by the intro but also by Sue Carrington who used fabric and built up layers and adding text stripes. 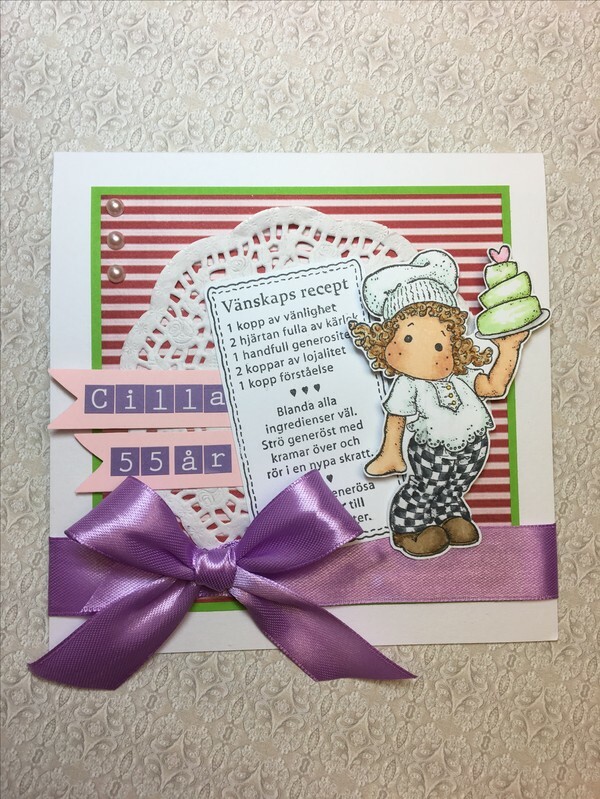 This card turned out as some sort of vintage inspired card, a lot different from what I usually create, fun! Here's a close up at the frame. As you can see the heart below got partly covered with some crackle paint but I choose to keep that one black. 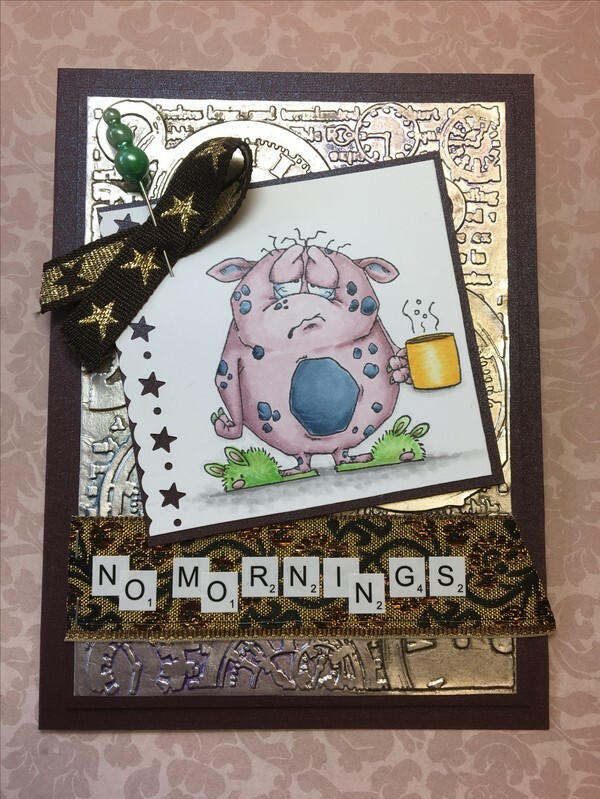 Well, my take is not in the same league but it's still fun to put some mixed media influences to the cards I make. This time the challenge is abut creating rust. From the intro the tag with a heart made by Nikki Ashton inspired me. 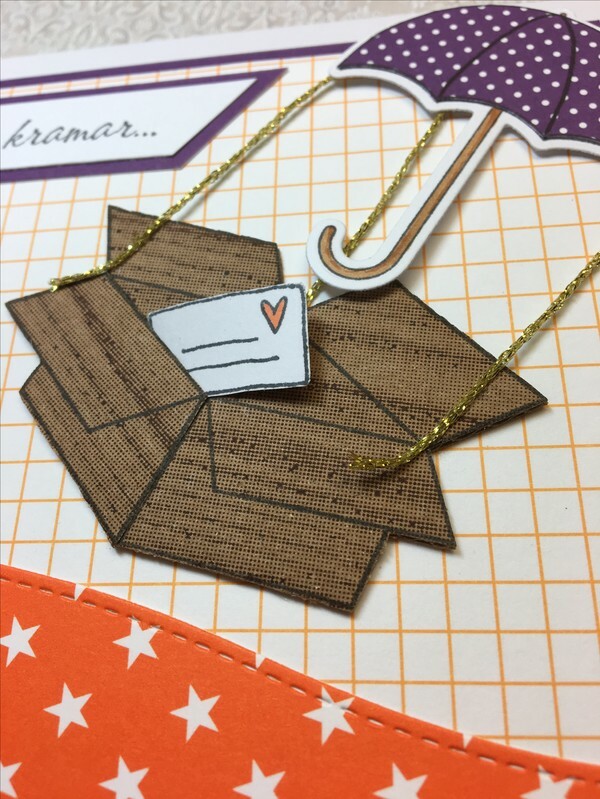 I liked the idea of coloring a chipboard to look like some sort of rusty metal. I read about how she used different colours to build up the feeling together with rusting powder. Well, I haven't got the powder and I used the paint I had, starting with black and then adding brownish and greenish colours. 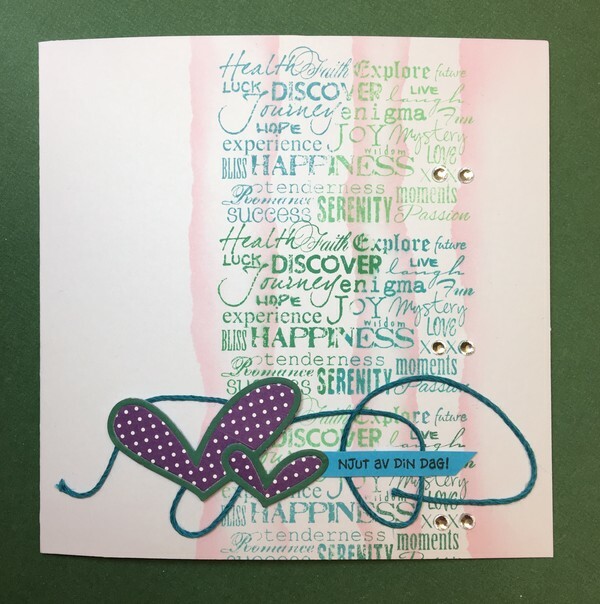 I also used fabric on my card, inspired from several of the examples shown at the blog. 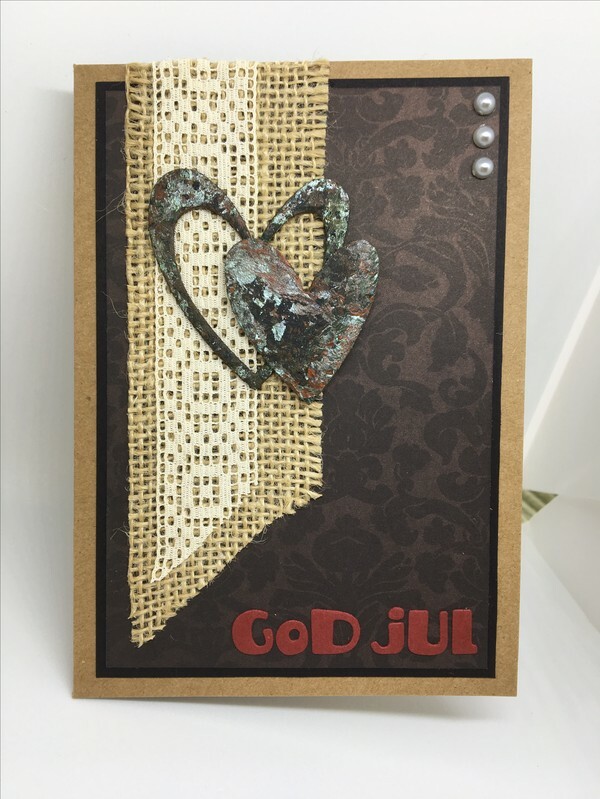 Perhaps I shall tell you that this is a christmas card: God Jul means Merry Christmas! Don't know if it looks like rust, but a sort of rusty colours at least. Nevertheless I'm quite pleased with how this first try ended even if I find it a bit too black. 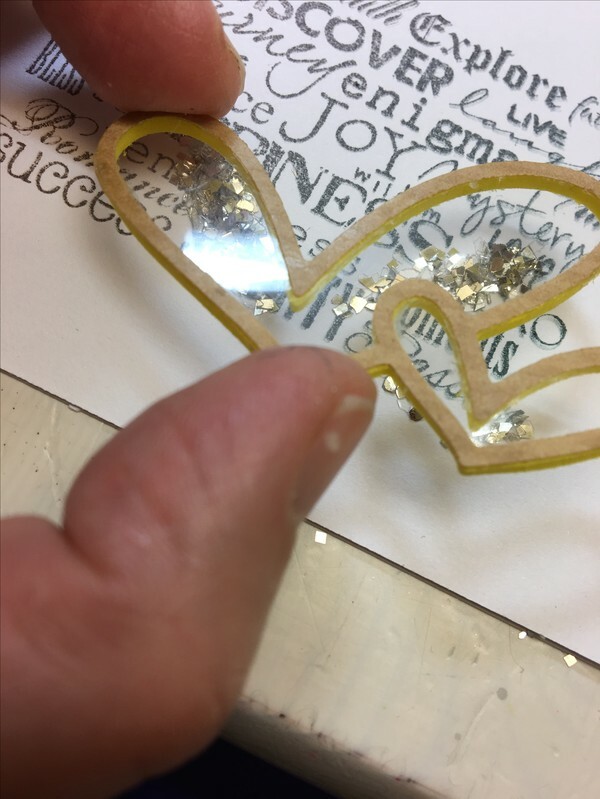 Another fun challenge at the Paper Artsy blog, glitter this time. What is great with their challenges is that they introduce each challenge with a lot of tips and tricks. 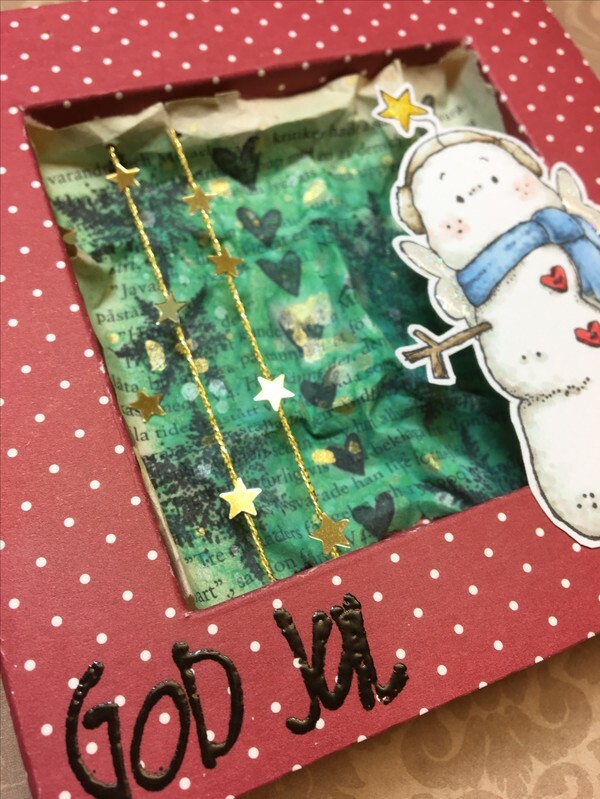 And the team keep on showing many fun ways of using glitter, you really learn a lot! 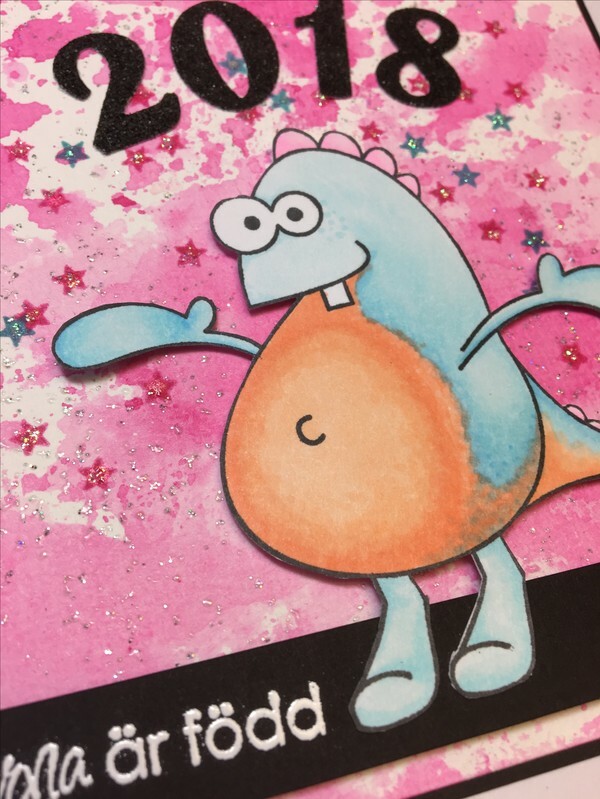 I've colored with copics and put him on 3D-foam to give the card a little height. 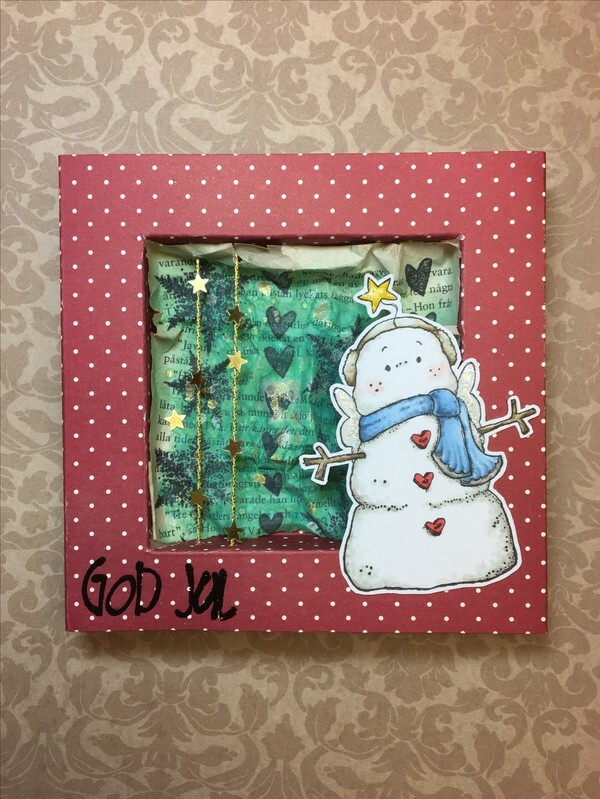 Jo with her beautiful advent calendar inspired me to emboss on chipboard. 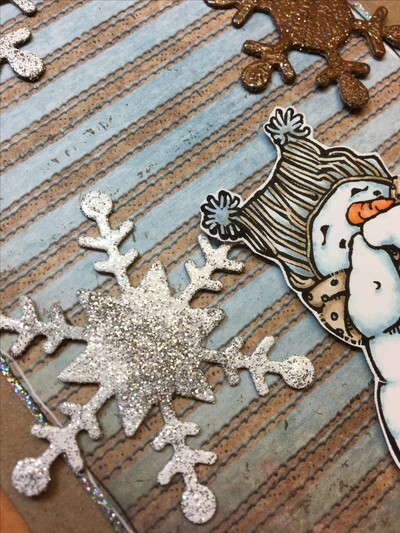 For my snowflakes I've used a pizza box, they're great for making chipboards! 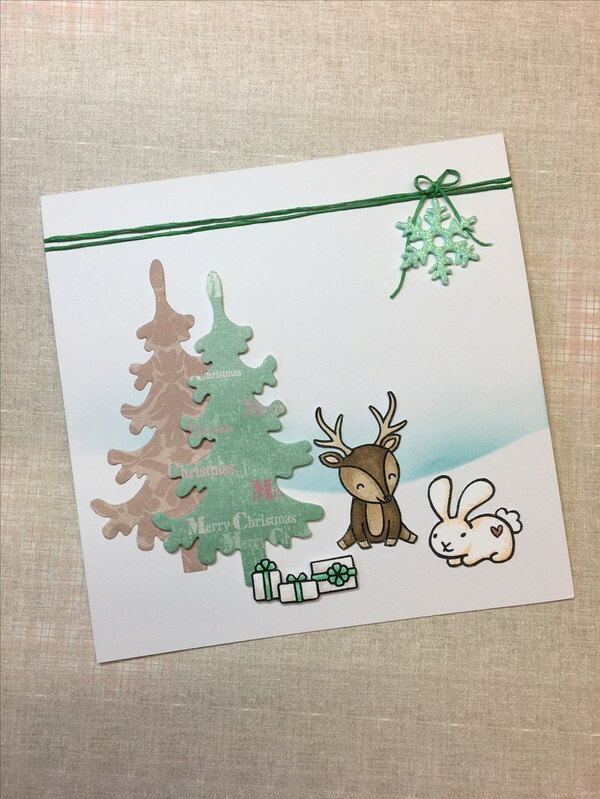 This one I gave a white and silver glittery embossing coat. I love how he is giggeling! This snowflake I covered with a hologram powder. Around the striped paper I've drawn a line both with a black and a white pen, inspired by Chris. 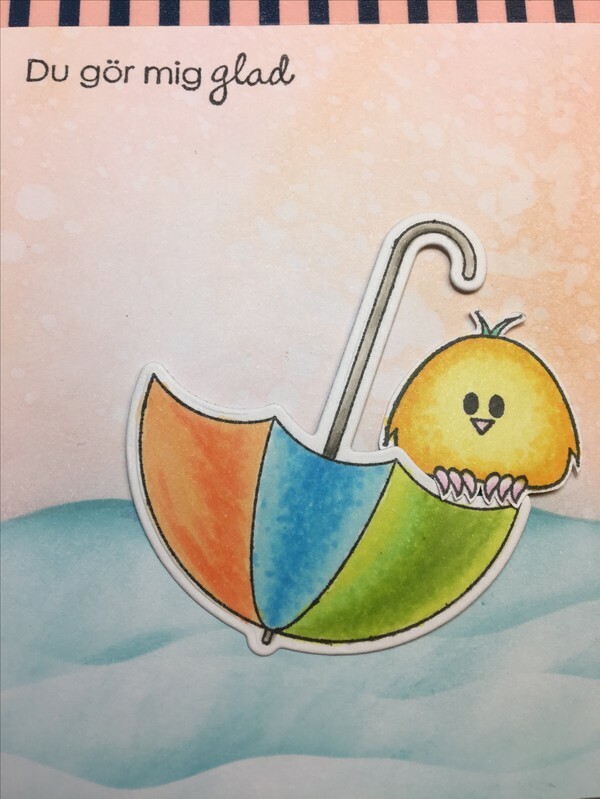 Actually, the whole card composition is inspired by Chris supercute penguin on striped background. So thank you both for a lot of fun inspiration and a great challenge! 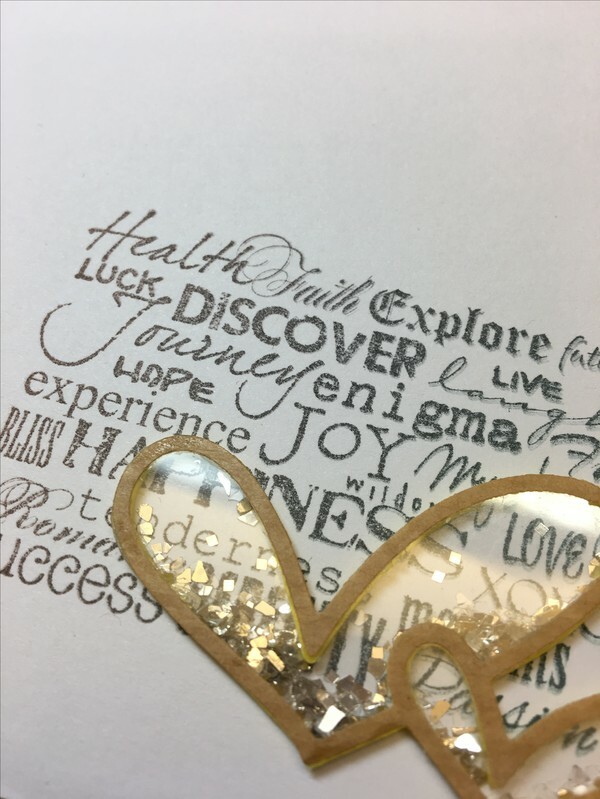 I found a fun challenge at Paper Artsy: Metallics! Well, a bit of a challenge for me, but that's the point of joining! 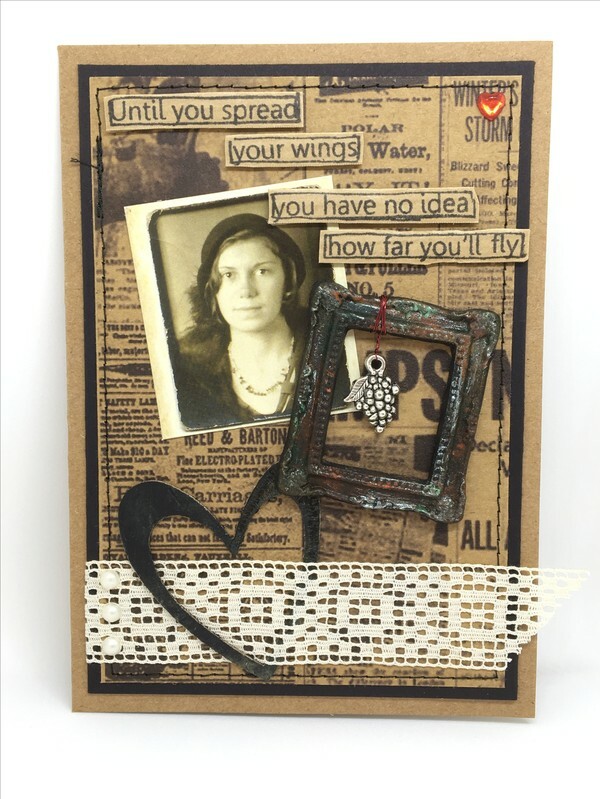 =) If you want some more inspiration, jump over to Paper Artsy blog, they show a lot of fun technics! 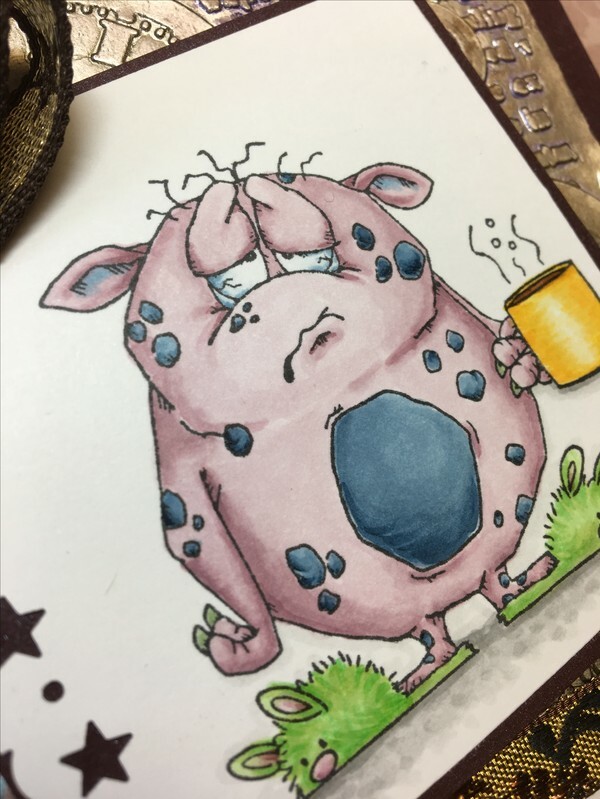 As a background I used a silvery paper, meant for isolating Saunas actually...Some leftovers from my husbands projekt =) I colored it with metallic Gelatos, used some metallic ribbons and a image colored with copic pens: ready! 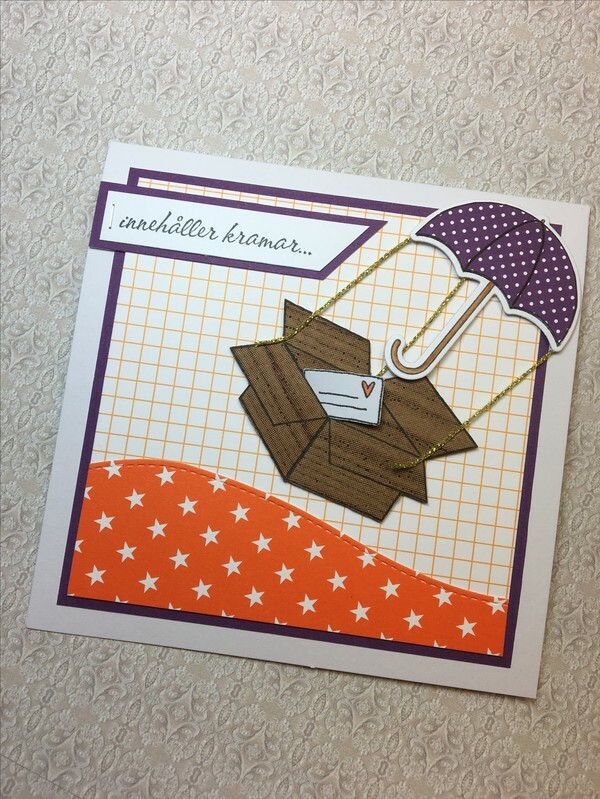 Thank you för a fun challenge! Vem vet, tredje gången gillt?! platt kort, band eller spets, minst två mönsterpapper, minst ett djur, en snöflinga och ett hjärta. I vanlig ordning så har jag färglagt med Copicspennor. Bakgrund är skapad med distressdyna och infärgningsverktyg. De små djuren kommer från lawn Fawn. Fler atc-kort, är ju så ruskigt kul!